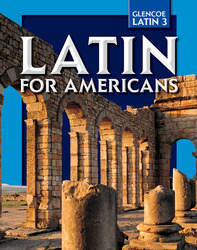 Latin for Americans, Level 3 (Ullman, et al.) presents a wide range of Latin literature. Information about authors lives, literary styles, and historical background is presented. Capture your students’ attention with this colorful visual program that enhances the content. Give an overview of the Roman literary heritage with a focus on Latin literature, including Pliny, Cicero, Aulus Gellius, and Ovid. Increase your students’ confidence in both Latin and English with expanded vocabulary and world studies. Enhance your lessons. The Teacher Annotated Edition contains everything you need for stimulating presentations in this all-in-one resource. The font used on this Web site will not support macrons. Documents Seized -- Caesar Involved?